The Crossed Orange Peel mini quilt was inspired by my love of traditional quilts, specifically orange peel quilts. I wanted to create a slightly more intricate version that had a modern edge and so I designed this crossed centre, which adds another dimension and has great scope for fussy cutting. 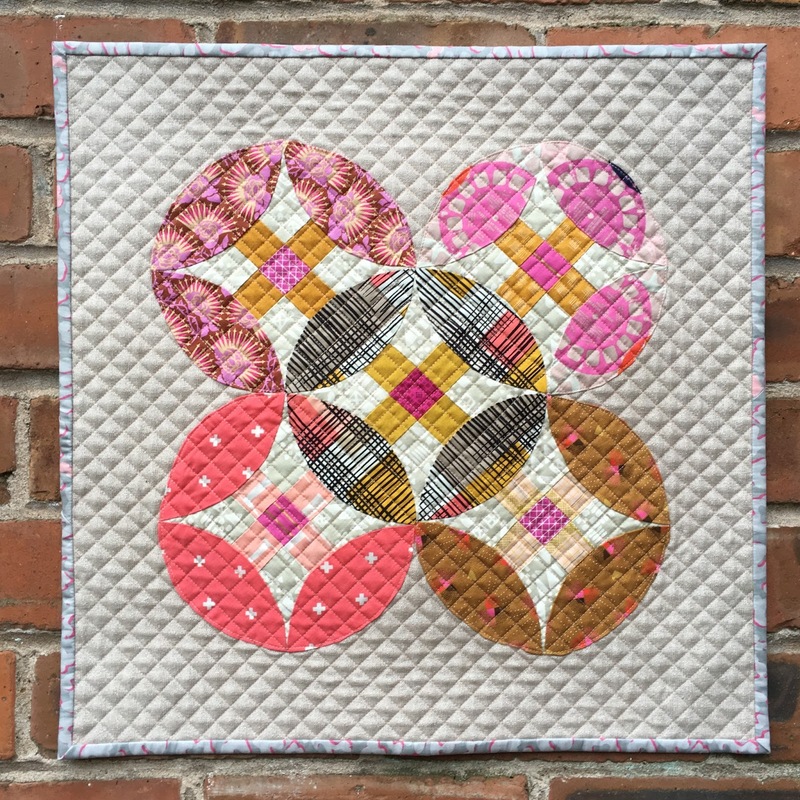 The pattern will be available in the December subscription of Modern Quilter's Box! 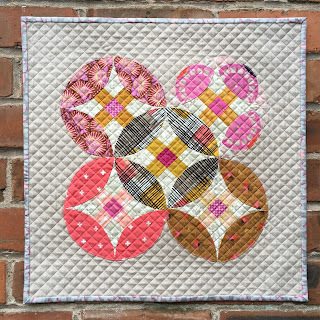 The Crossed Orange Peel blocks are all hand pieced and then appliquéd to the background, the pattern includes tips to make it simple and you could easily add pieces to make a bigger design or keep going to make a whole quilt! For the fabrics I went with a variety of Cotton and Steel prints, mixed in with Art Gallery Fabrics, Denyse Schmidt, Carolyn Friedlander, Anna Maria Horner, Victoria Findlay Wolfe and Libs Elliott. Basically I threw in all my favourite prints! The colour scheme of brown/mustard, pink/peach and neutral/grey is a new favourite of mine because it is fresh and bright but still warm. The background fabric is Essex Yarn Dyed Metallic in Oyster, these metallics are amazing! They don't show so well in photos but the sparkle in real life is just beautiful. The quilting is a simple cross hatch, spaced at 1/2" - you can find my cross hatch quilting tutorial here. I used Aurifil 50wt thread in #2420, described as fleshy pink, really the softest shade that adds such a gentle hint of pretty pink. It is really exciting to know that subscribers will be receiving the pattern this month and I am so looking forward to seeing people making it, it will be cool seeing it made in different fabrics and colours! If you would like to get your hands on December's box, which also includes new fabrics, more patterns and sewing treats, then head to Modern Quilter's Box now! 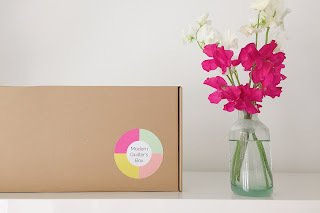 They do monthly boxes as well as digital subscriptions and you can even take a peek at the contents of previous boxes so you can see how fabulous they are. I am hoping to find time to create a full sized quilt of this design, once I finish a few other hand sewn quilts. The scope for playing with colour and balancing the peels with the central pattern on a bigger scale is really enticing. I am really proud of this mini as is though and it will be going on the wall in our house when I've decided on the perfect spot! I really like how this little quilt turned out! What a beautiful pattern! It would look wonderful as a big quilt, too! Stunning! I really adore what you've done here. What wonderful work with fabric and color!